(Nanowerk News) Novel monoclinic subphases in ferroelectric BaTiO3 were observed by Center for Nanoscale Materials users from The Pennsylvania State University in collaboration with CNM's X-Ray Microscopy Group and scientists from the Center for Nanophase Materials Sciences (see paper in Nature Communications: "Thermotropic phase boundaries in classic ferroelectrics"). The newly discovered low-symmetry intermediate phases are found to be locally stabilized near thermotropic phase boundaries in simple ferroelectrics, and they exhibit large enhancements in nonlinear optical and piezoelectric property coefficients. The findings reveal that phase transitions in ferroelectrics are intimately coupled to the underlying domain microstructure. Nanoscale scanning X-ray diffraction measurements harnessing the unique structural sensitivity of the CNM Hard X-Ray Nanoprobe unambiguously demonstrated the intrinsic monoclinic nature of the subphase. The discovery presents unique opportunities for the design of "green" high-performance nanoscale energy materials. 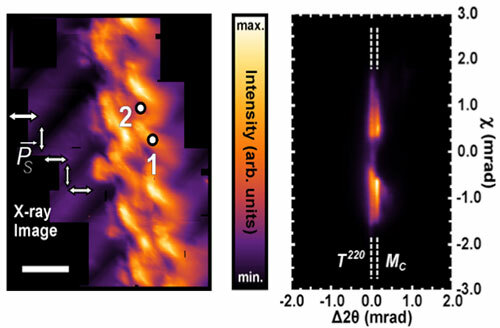 (left) Nanoscale scanning X-ray diffraction spatial map of the (220) Mc peak in BaTiO3 and (right) diffraction image of spot 2; scale bar 8 µm. This projection image is of the entire structure, which exists a few microns into the material. Even in lead-free BaTiO3 and KNbO3, classic materials that have been known and studied for more than 60 years, this new observation shows that domains can lend a thermotropic character to their otherwise well-known phase transitions. This leads to the emergence of intermediate monoclinic phases in a wide temperature range around the conventional interferroelectric transitions. As this phenomenon is due to the mechanical and dipolar interactions between competing ferroelectric-ferroelastic domains in a complex domain microstructure, advanced nanoscale-resolved multi-technique measurements in the same spatial location are required to properly reveal the underlying physics on a microscopic level. This work shows that in the stabilized intermediate phases, both the piezoelectric and the nonlinear optical properties can be strongly enhanced and even newly induced. Since the mechanism of symmetry lowering through stresses and fields is in principle universal to all nontriclinic ferroelectric crystal systems, these results suggest a host of possibilities for the design of high-performance phases that can create unique nanoscale energy materials from simple lead-free ferroelectrics.